Regardless of the purpose, events are designed to deliver an impact, while bringing people together to create real human connections. Transforming attendees into brand advocates is the most powerful proof of a successful event. Consider the meeting format and special needs, such as AV equipment, lighting, whiteboards or other infrastructure. Determine how many people will be invited compared to how many will actually attend, where they will be seated and how. This will also determine how many staff members you need on hand. Consider your guests’ experience and needs. Will they need food, drinks? Will they need special settings for formal and informal activities? This will determine whether you provide snacks and drinks, contract a caterer or decor vendor. Define a budget and revenue model that sets up your event for success. Do you need to seek sponsorships or charge your guests? Do you want to break even or make money? When planning a fundraiser, be sure to engage an experienced professional to help you minimize costs and maximize value for your initiative. Consider a venue with modular design to accommodate formal larger conference discussions and smaller breakout sessions. Consider an offsite facility that’s conducive to free thinking; a place with minimal furnishings or walls; and plenty of whiteboards. Find a flexible venue where creativity can take place. Consider a venue that provides a blank canvas, where your ideas can easily take shape. Consider developing a blog post to drive attendance. We recommend Medium and Tumblr as a great tool for publishing. Using sales tools, such as HubSpot or Salesforce, can improve overall effectiveness by tying your registrants and outreach efforts to your business systems. 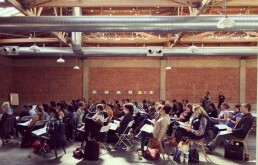 Use Mailchimp to expedite large-scale communications; and Eventbrite or Meetup to manage registrations. Facebook events can reach people where they’re at. Make all hashtags (event specific and those of your partners) visible on all communication to maximize social media campaigns. Hand delivered invites- never underestimate the power of hard copy invites; they can be handmade cherished treasures. Don’t stop communicating as your last guest leaves. Continue the dialogue! Send thank you’s within 24 hours; ask friends to upload photos in a shared space and leverage impressions so that you can improve your next event! The above will allow you to get a better sense for timing, costs, needs and other resources that might be needed. Anyone you engage to help coordinate will ask these same questions, so it’s best to begin by first giving shape to your thoughts! In reality if you don’t have these fundamentals in place, you don’t have an event!